Solution: The separator design was analyzed through CFD to estimate the separation efficiency. The results obtained were close to the claimed efficiency of 99 percent. The separating efficiency of oil and gas separators is dependent on factors such as physical and chemical characteristics of the crude, operating pressure and temperature, rate of throughput and the separator configurations. A leading offshore equipment manufacturer needed simulation solution for the oil and gas separator designed to provide the separation efficiency of 99 percent. The separator aimed to provide 99 percent of separation efficiency was modeled through CAD tools and the simulation domain was identified. Considering the volume fraction method, suitable turbulence models and boundary conditions were applied. 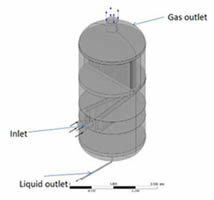 Volume fraction at liquid outlet and gas outlet were measured and were found close to one, suggesting that the separator design was adequate to provide the separation efficiency above 99 percent.